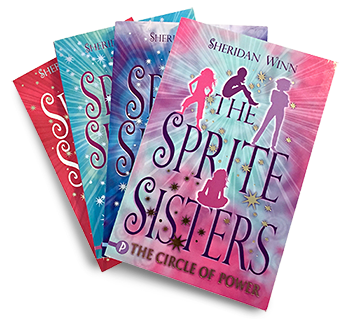 The idea for a series of books about four sisters with magical powers aligned to the four elements, popped out at 1.30am on 22nd January 2007. Sheridan Winn was writing her diary and noted down the one-sentence idea. When she woke next day, she had the certain feeling that this was a good idea – the one she had been waiting for. She approached Piccadilly Press’s Brenda Gardner, who agreed, and commissioned The Circle of Power. Although everything then seemed to move very fast, Sheridan had waited many years to start writing stories. In 2012, Sheridan self-published the sixth title in the series, The Boy With Hawk-like Eyes, as a paperback and e-book, and bought back the rights to the first five titles from Piccadilly Press. She then set about re-publishing the stories herself, with new-look jackets – so became publisher and a bookseller, as well as a writer. Vol 7, Magic at Drysdale’s School, and Vol 8, The Mystery of the Locked Room, followed, which are available in English. 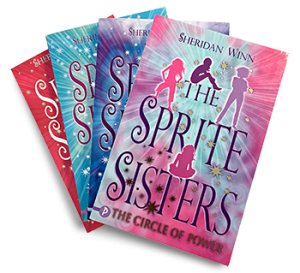 Since then, Sheridan has written Sprites Vols 9 & 10, along with three prequel stories, which are published in German for the time being. 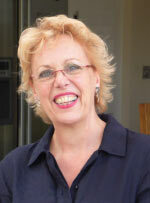 A lively and engaging speaker, Sheridan enjoys the chance to interact with her readers. She lives in Norfolk and has two grown-up children and a grand-daughter. She has a keen interest in the Arts, particularly painting and film, and finds walking in the countryside a good way to think up ideas. She always carries a notebook.